Mountain Gorilla Habituation involves making them familiar around human beings. The habituation experience takes place in Bwindi Impenetrable National Park gives you more than just a glimpse at the mountain Gorillas but a whole different story with these endangered creatures. The Habituation Experience is only offered in Bwindi Impenetrable National Park in Uganda which shelters over 500 mountain Gorillas. And this has made Uganda one of the Top Tour Destinations in Africa. Habituation experience gives you a lot more time than just trekking since you have to involve in the Gorilla Habituation itself. You will observe researchers from Uganda Wildlife Authority as they go about their daily duties around the Gorillas; monitoring and recording their behavior. Gorilla Habituation Experience normally takes two to three (2-3) years to be completed and during this time, researchers keep on visiting an identified Wild gorilla group on a daily basis. They get to learn more about individual gorillas and the way they behave. This process allows you to be with Mountain Gorillas for up to 4hours as compared to the 1Hour of Gorilla Trekking making it so rewarding. Gorilla habituation experience also give you a chance to learn about the naming of these endangered creatures and to take more pictures as long as your camera Flash is turned off to avoid upsetting the Gorillas. •	Make sure that you are in good health to avoid spreading the disease to the Gorillas. For example, they can easily catch a cold if you have it. •	Cary enough packed food and water to avoid starving while in the jungle. Gorilla Habituation Experience Permit is currently at USD1500 per permit in Uganda and tourists are allowed to stay with the gorillas for 4 hours. The cost is different from the Gorilla Trekking Permit which costs USD600 and the time to spend with Gorillas is strictly 1 hour. It is advised to book in time have your permit secured in about Six months to your trip to avoid any inconveniences. The permit includes rangers, researchers and spending four hours with mountain gorillas under habituation. It also includes park entrance fees for Bwindi Impenetrable National Park. Habinyanja, Rushegura and Mubare which are found in the North of the park, Mishaya, Bweza, Nshongi, Kahungye, Busingye and Nkuringo gorilla group are found in the south of the park. Far off in the East of the park are the Oruzogo, Kyaguriro and Bitukura Gorilla groups. In Conclusion, as you plan your safari to Uganda, consider having an amazing trip with the closest contact with Mountain Gorillas in the jungle. 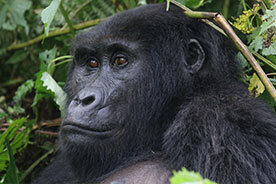 Gorilla habituation Experience is a rare activity in Rwanda and Congo and can therefore be only experienced in Uganda. And please note that not all gorilla families are available for the habituation experience. There is no better place to consider for your safari than the pearl of Africa-Uganda. Despite the social-political challenges, this beautiful country has been identified as one of the relatively stable and prosperous African nations. There are a million reasons for you to visit Uganda starting from the good weather thought the year and the green vegetation plus wildlife. A number of things make Uganda the most desired destinations for travelers and this is a highlight of the top tourist attractions in Uganda.